We will reiterate that nothing can change your destiny to leave the lower dimension behind, except that you lose your way and cannot lift up out of it. The opportunities to rise up are unlimited and if you are on that path you should already have made such progress, that you have established yourself in the level of vibrations that will see you safely through. You will get all the encouragement you need, and as your level of consciousness increases so you will achieve a greater understanding of what you need to do. Keep in the Light that you surround yourself with, and know that you are secure within and safeguarded from any attempt to interfere with your plan for Ascension. Allow the lower vibrations to pass you by without becoming involved in them. The turmoil that many countries are going through is a sign that they have tried to solve their problems or differences by force, which will never be the answer to such situations. They will come round time and time again, until it is realised that only co-operation will achieve a solution that will bring lasting peace. Your history is a monumental testament of repeated attempts to rule by force, and shows that peace achieved by such methods is never lasting. The answer to all such problems is the application of “love” and the understanding that you are all One. Yes, we know that until people are ready to respond in this way you will not get far, but all solutions have a beginning when the seeds are sown. Love is a most powerful energy that can bring about miracles when all hope seems to be lost. It is therefore important that those who can provide and share the higher energies are dedicated to their role. After many lives in the lower vibrations you are able to meet the challenge that they present, and as you progress matters will seem easier to deal with. They are helped by the incoming higher energies that are being beamed to Earth from other civilisations. Be assured that many of them are aware of your plight and most pleased to have the opportunity to assist. Indeed, when you have successfully achieved Ascension many civilisations will joyously await their invitation to meet you. There will be a gradual coming together which is consistent with you taking your place in the Cosmos. However, much has to precede such times but you are on course to rise up and become Cosmic Beings. These are wonderful times to be associated with Earth and her journey into the higher vibrations. Many souls would have liked to be part of the experience, but you who have been selected are the ones that are best suited to the tasks ahead. You are much more than you are aware at present, and it is as though you are coming out of a dream state. Some might liken it to a nightmare but whatever way you view it, the time has arrived for a massive change in your fortunes. Be patient and apply yourself so that you can use your best attributes to help others awaken to the truth. Many souls are unaware that there is no such thing as total death, as the soul is immortal. You may cloak yourselves differently to experience particular lives according to your needs, but always the soul is supreme and holding the Light of Love. We are both surprised and pleased that you have taken on your tasks with such commitment. Instinctively you know the importance of this time and your joint efforts are achieving success beyond your knowing. So never lose faith in your ability and know that you have much help to ensure you cope with the demands upon you. As you open up you will find that you have far greater abilities than you imagined. It is the reason you were selected for the end times, and we know that you will succeed in your tasks. Indeed for some of you this time round will not be your first experience, and for that reason you may find yourselves on familiar ground. Be aware that the importance of the present time for you and Mother Earth has not gone unnoticed, and Beings from many civilisations are gathered to observe your Ascension. We remind you that it will be the first occasion that you will have risen up, without making the transition through the “death” of the body. There will be so much to learn that will be new to you, and it will set you on the path to being a Cosmic Being. That is of course quite a way ahead but we would like you to know what you might expect in the higher vibrations. Every effort you put in now will be well rewarded and you will not regret a single moment. Mean time you will be gradually enlightened as to the changes that will be the first of many, and they will help you to quickly adjust to the new vibrations. This is where we can be of great assistance and share with you the benefit of our experience. We want to help you make up for lost time where you have been held back, and quickly introduce you to the many advancements that will speed up your transition to the higher realms. It is not given to any individual to know the life plan of another soul. You should therefore exercise caution when judging another soul, as you cannot know what the future holds for them. Each of you have made your commitments where your progress is concerned. They are tempered by karmic needs that are neither good or bad as you would term them. All karma no matter who it involves will provide the lessons that will help the soul to evolve. So treat all experiences as essential to your development and upliftment. I am SaLuSa from Sirius, and pleased that our contact with you has helped your evolution. Bear in mind that we have been drawing ever closer to you for some 70 years, and in that time we have noted your rapid growth in consciousness. It will continue as the vibrations keep on rising up, and in time they will enable you to completely leave the lower ones behind. I wish you continued success in your work on behalf of the Light, and the Love that you spread around you. 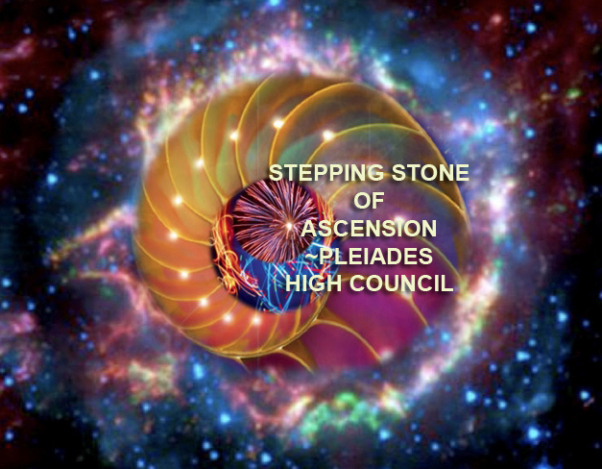 The stepping stone of ascension has indeed been placed by all of you on the earthly grounds of GAIA to accelerate humanity’s further growth of their benevolent selves. To accelerate humanities return to their wholesome selves through the gateway of the abyss of their hearts. As the stepping stone has indeed been put into place by the benevolent creation prowess of your very own being, the time has once again come for humanity to make the final decision to either step gently upon the foundation laid out for them to access their highest octaves of being leading them on the road to embracing of their higher selves and ways of life, or to return to the state of chaotic misrepresentation of that which they believe themselves to be. The chaotic misrepresentation of that which they believe themselves to be, shall cause much upheaval and degenerative processes to occur within their psyche, shall they chose to return to the state of chaos that they are accustomed to. As the free will of those dwelling therein continues to drive the ever clashing forces within their hearts the Armageddon within their very own selves will continue to rage and bring forth tremendous changes that most are not ready to withstand. For the classification principles of their vehicles no longer meets the classification principles of that which GAIA has become. For the frequency of GAIA no longer matches the frequency of the olden days. No longer matches the frequency of that which most present on your planet are indeed accustomed to. And hence, in light of the very changes which are occurring within their minds, bodies and souls, the clashing of forces continues to escalate bringing with them the chaotic state of being on GAIA. Nevertheless, the heart codices have indeed begun their journey into the eternal understanding of that which humanity has come to experience. And as such many souls have indeed stepped onto the foundation that you have all built for them with your light and your manifestation abilities. With your might and your manifestation abilities of bringing forth that which must be created in order to progress and to assist human souls in returning back to wholesomeness, back to ONENESS. The assistance that you have indeed provided and continue to provide has played out in the most benevolent experiences for all involved. And as such, we congratulate you for your efforts, we congratulate you and applaud you for stepping foot into the darkness of yesteryear and building a corridor of light through which all can enter into a newly build frequency of their newly built world. The achievements that you have indeed established and brought forth through your endeavors will continue to rise in a spiral like motion, will continue to rise through the evolutionary stages of release from the slavery to their ego selves. Will continue to rise in an upward spiral, culminating in the point of no return. Let us then remind you once more that albeit the stepping stone which has indeed been erected, many upon many of your earth brothers and sisters shall resist any and all attempts, and refuse to step onto a new path. For there are numerous groups of earthlings, groups that shall progress and awaken at their own pace, and as such , there shall be those that awaken faster than the others. What we are trying to say to you dearly beloveds is that times ahead shall find you assisting many upon many such souls and will find you funneling these souls through a corridor of light and love that you have created, and assisting them in taking their very first steps to freedom, benevolence and peace. And so and thus, many of you are finding yours lives in chaos, your lives changing rapidly, as you are being pushed in to the direction of the healing abilities and gifts of splendor that you have indeed brought onto this planet. And as such, you are witnessing blocks of your life fall away, many of your friends and loved ones suddenly disappearing form your lives and a set of new acquaintances taking their place at lightning speed. Your work, health, relationships, everything is changing rapidly for you now, and will only continue its upward spiral as you are being equipped to take on a new role, in the ever evolving and ever expanding universal consciousness that you are indeed anchoring into GAIA. Take stride and walk with dignity toward your newly found lives, step confidently into your newly found abilities, fear not that which you do not know, but seek out ways of understanding the new experiences that you are immersed in daily. For indeed you shall begin to see us in your waking hours, appearing before you and teaching you the new way of life, presenting various lessons to you on how to materialize that which you wish to see in your world. Reminding you how to manifest, create and BE true to that which you have come here to be! Allow these rapid changes to showcase to you the true glory of your soul, the true glory and benevolence of all that you are! Stand with dignity and allow the energies to assist you in moving closer to the benevolent culmination of the mission at hand. Sometimes it is important to step back and take in the scope of things. Today is one of those days. When we step back, the magnitude of the times in which we are living is revealed. We understand that we are in the midst of a living process of great change. This is an honor. 2014 is all about change. Are you resisting it? Are you accepting it? Are you embracing it? There are pools of energy that tempt us into wallowing in disappointment, disillusionment, and emptiness (particularly about a perceived loss or failure) today. These things are part of the past, and as such, are not part of embracing the future. Embracing the future is the second element to today’s “mission.” First we step back and try to really integrate the full-blown changes in consciousness that are happening, and then we open up to the effects this will produce. Real change is happening and the future is bright. This may be hard to see today because the Moon will be moving toward opposition first with Jupiter (8:30 pm ET/00:30 am UT) and then opposition with the Black Moon (Saturday at 7:38 am ET/11:38 am UT). We want to work the positive imprint as best we can by welcoming change. If you find yourself struggling under these aspects, the best medicine is always to go outside. Reconnect with the natural world. Ask for guidance. The ancient imprint for today’s energy involves fellowship, joy, and celebration of life itself. This has been horrendously twisted, but we retain the spark of it. Let’s spin these things back into the web of reality today, wise owls. Here’s my kind of Halloween visual for the day: From our view on the shore, we take in the spectacle of the monstrosity of the matrix collapsing into the ocean, tentacles flailing. Lightning is flashing in stormy skies. The horror is sinking away. We are shocked and awed. To the side, something else flashes. It’s the Sun, breaking through the clouds. We turn to it and follow. Being Indian is being spiritual. It is not the color of our skin. Being Indian is how we think. We need to learn our culture, our language, our dances, our traditions, and customs. It is one thing to know these things, but another to live them. We need to spend time with the Elders and get their guidance. We need to go to the mountains, woods, and desert to pray. Being spiritual is the way for us to think right. Walking the Red Road and thinking right is the greatest gift we can give to our children. If the energy of this lunar month is like being on a sight-seeing bus filled with bold tourists going where no one has gone before, today the bus stops for gas and repairs. An opportunity to explore presents itself. In keeping with the energy of “pausing” and taking a departure, let me tell you a story of the day instead of giving a report. Many of us on the bus wish the driver would’ve stopped in a better part of town, so to speak. Everything looks ominous. Symbols of death abound. Do the people that inhabit this place worship death? Shadows seem to stalk us, only to flee when we catch a moment’s glimpse of them. The light of the Full Moon casts their reflection off of a calm river. One of us notices a large canoe along the bank of the river. It is big enough for all who decide to take a side trip, but who will go? What possible type of phantoms could lie deeper in this realm? Another of us thinks to check the map. It indicates that a place called Shadow Springs is a short distance by water. The map says it is a hot spring. Some of us decide to find out. Grabbing a few torches, we ease into the canoe, setting out in the direction of these Shadow Springs. We soon discover the map did not tell us we would be paddling through caves. Because we are bold, we continue on, not looking back, trusting our ability to take care of ourselves no matter what we encounter. A strange thing happens when the firelight of our torches reflects off the cave walls. Some of us see ourselves and our fears reflected. Monsters of our own making thrash about and we are captivated by the scene. We see what holds us back. We see what we do not want to face. Just when our fears seem like they will overtake us, a warmth fills the air and our melts away the shadows of Shadow Springs. It is indeed a hot spring – a place where the hearth of the Goddess heals our souls. We all jump in, immersing ourselves with Oneness, with all the lost parts of us that linger in shadow. They are not phantoms; they are lost parts of our own power. We take them back with us, integrated and back home inside of us where they belong. In case the message gets lost in translation: It’s a Black Moon day, one of the last during the Black Moon’s jaunt through Leo, and one of the last of the rebirth stages that those with the Black Moon or Sun in Aquarius or Leo. The energy brings out people’s core fears. People project those fears onto others. Analyze what people are telling you about yourself from this perspective. They are probably talking about themselves but don’t know it. We project what we cannot face about ourselves. Black Moon days try to trick us into feeling separated from Spirit by giving us illusions of fear. New readers can look up their own Black Moon and the core fear identified by it in the Appendix of my book on the Black Moon – free on the Books tab at http://www.oraclereport.com. This is information all wise owls need to know about themselves. Know yourself, know the universe. Face what you see about yourself today – the good and the not-yet-so-good. Remember that the not so good is based in an illusion of fear – of a false belief in separation from Spirit. Let the gentle warmth of the Goddess bring you back to where you need to be. This month’s journey on the “sight-seeing bus filled with tourists” takes us along the water’s edge today. The energetic signatures that most of the planets are delivering today involve water. Water is symbolic of emotions, cleansing, the unconscious mind, and mutability (things being changed by outer forces). Water can be placid or it can be whipped up into white caps. Since we will likely see and/or experience the variety of these “watery” states today, we will invoke the shamanic skill of being like the wise owl in a tree in inner contemplation and outer observance. It’s easier to do when you remember the “observe” element. We aren’t in stasis in our inner contemplation. We are also alert to the liveliness of the world around us and the way Spirit wields the collective dream to impart messages, information, and wisdom to us. So we are open to direct interaction from Spirit, but neutral to the matrix. This month’s ruling Wisdom Goddess is Kamala, who is also known as the Lotus Goddess because she brings passions back to life for blooming. She is especially good at helping us make admissions to ourselves about our shadow sides. When we integrate more of our shadow side, we become stronger. Today she will attempt to mutate or change patterns of behavior that keep us from actualizing the brilliant light codes of our souls. She draws something out of us, possibly something very deep, and then blesses us. Acceptance is a necessary aspect for the enlightening human being. Let us explain why. If you can accept that you are a vital and beloved piece of Source energy, and that you are loved unconditionally, you will start to see your brilliance and value. As you accept you are loved unconditionally, you will fill up with that love and it will spill over, allowing you to love others unconditionally, and drawing even more love to yourself in return.